Bart, aka BL Be Yours, is a handsome 2½-year-old red brindle male born September 5, 2005. His sire is BL Be Mine and his dam is Jr's Mercedes. 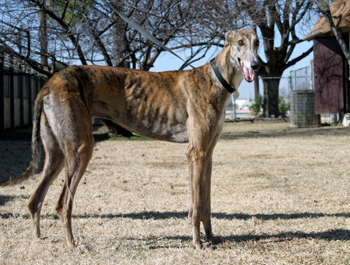 Bart's 12 race career started at Southland Race Park in West Memphis, Arkansas, on September 17, 2007, and ended on January 16, 2008 at Valley Race Park in Harlingen. Bart is on to bigger and better things - like finding his forever home! Bart is definitely a BEAUTIFUL BRINDLE BOY!!! He keeps us laughing with all of his antics when he has a lot of energy and wants to play. He definitely has a lot of puppy left in him and sometimes he is like an awkward teenager with his long skinny legs and body. He has accidentally stepped on his foster brother a couple of times and has paid for it! On arrival Bart explored the house thoroughly without missing a thing! He gets along very well with his foster brother and sister and four cats. He does keep the other greyhounds on their toes by wanting to play and run in the backyard. He loves to play with humans too! He will playfully jump around and chase toys. Occasionally, if you're really lucky, he'll give you a cute "smile" when he is happy to see you and loves to rub his head against us to show affection. He is a joy to pet because his fur is so soft! Bart also lives with a 6 year old who he enjoys playing with. He refuses to even look at the cats. If one is sitting in the hallway, he turns the other direction - FAST! Bart LOVES to eat and is tall enough to rest his chin on the counters. A firm "No!" redirects him and he is off to explore something else. He is doing quite well potty training with only a couple of accidents, but he is learning quickly. He spends about eight hours in his crate during the week and sleeps on a bed in the bedroom at night with the baby gate up. 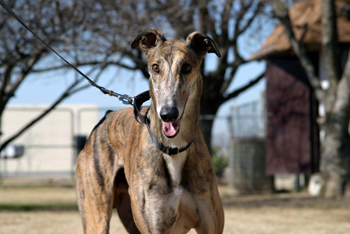 If you are looking for a spunky, sweet, beautiful greyhound this may be the boy for you!